The scene is the same almost every day. 5 o'clock rolls around and no one is bringing me a glass of wine, no one is meeting my husband at the door with a martini. The kids probably haven't done their homework, and are probably in need of showers. The pets are even circling the kitchen, knowing that dinner time is approaching. My husband and I look at each other and ask at the same time "What do you want to do for dinner?" Does it happen this way in your house? We don't plan ahead. We usually have the makings for a few of our favorite meals so we can throw something together, but we end up playing Rock, Paper, Scissors to see who has to choose and cook. 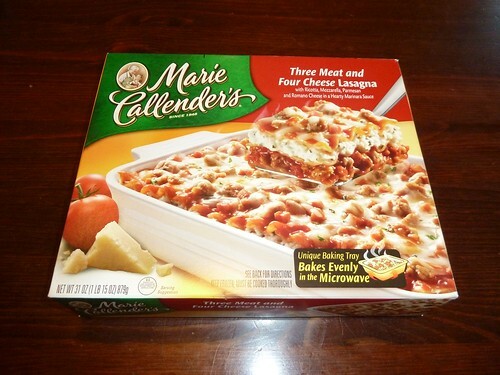 This week we added a new quick meal to our arsenal, Marie Callender's Three Meat and Four Cheese Lasagna. Yep, frozen lasagna. My husband and I worked with young people for twenty years and frozen lasagna is one of those "go-to meals" for youth groups. Countless times I have prepared several large trays of lasagna and waited for them to cook through. It took FOREVER and there were always several tall young people surrounding me wondering when they would be able to eat. The lasagnas were edible, but not something I would choose for my family. I was skeptical when I received the coupon from Marie Callender for the lasagna. Could a frozen lasagna win me over? This past week has been a little crazy in my house. School has started and we are learning the rhythm and routine of a new schedule. 4 different family members had birthdays so we had big birthday dinners. After the hoopla we found ourselves on Thursday needing something for dinner and we were all hungry. I was thrilled when I remembered we had the lasagna in the freezer. I was even more excited to learn it only takes about 19 minutes to prepare (14 minutes in the microwave and 5 to sit before you serve.) This is another place I was skeptical. I have never liked cooking pasta dishes in the microwave. I think it makes the pasta mushy. While the lasagna cooked I had time to make a salad and toast a few pieces of garlic bread. I actually enjoyed the lasagna. The pasta was firm and there was a good balance of ingredients. Marie Callender's has developed a new baking tray that allows for a more "homemade" taste. There was enough spice to add great flavor without being overwhelming. I was very happy about that because my kids protest if foods are too spicy. I only had one complaint about the lasagna, it was on the small side. I have a growing teenager who is currently a bottomless pit. I would love to have the option of buying a larger lasagna instead of 2 smaller ones. The one we had was gone immediately with my family of four. "According to a national taste test, Marie Callender’s Three Meat and Four Cheese Lasagna is preferred over Stouffer’s 19 oz. Lasagna with Meat & Sauce by consumers two to one. Marie Callender’s delicious blend of meats and cheeses combined with its unique baking tray creates a homemade tasting meal you can be proud to serve to your family" You can find other information on the Marie Callender's Meals website. I will be buying the Marie Callender's Three Meat and Four Cheese Lasagna again. I like having something hearty on hand that can be prepared quickly. I might even check out some of their chicken dishes. The Motherhood supplied me with a coupon for the lasagna and is compensating me for my time. As always opinions expressed in my post are mine, all mine. Yay for lasagne! I'm all for quick meals, I will have to try that! Muppets ~ Interview with Kermit the Frog!